Image of the Dual-ridged pyramidal horn (no sidewalls). This antenna is a variation of the traditional Dual Ridged Pyramidal horn, which is currently available in Antenna Magus. The side walls of the horn have been removed, whilst the extreme tips of the antenna flare have been chamfered. 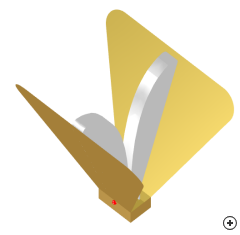 These modifications reduce the pattern degradation (beam splitting) seen at the higher frequencies with the traditional Dual Ridged Pyramidal horn. An increased pattern bandwidth of 11:1 is achieved before the beam splitting starts to occur. This is illustrated in the image below where the radiation patterns of both horns designed for an 11:1 bandwidth are shown at the highest frequency in the band. The degradation of the pattern of the horn with sidewalls is clear when compared to the horn without side walls.